Cat Insurance in Spain with fixed premiums for life, any age or breed and use of any Vet in Spain with options for European Cover. Peace of mind with pet insurance. At www.insuranceinspain.com we love Cats and all pets. 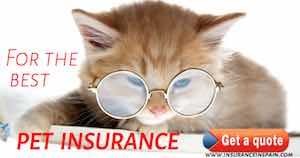 Cat Insurance in Spain is a simple process and our staff are more than happy to help you complete this process. Most of our staff have their own pets and are familiar with the types of pet insurances that are suitable for the Spanish marketplace. www.insuranceinspain.com can provide you with comprehensive cover to protect your pets, dogs and cats in Spain. We can cover dangerous dogs, with or without third party liability, veterinary fees, and much more. Details of the cover are indicated below. We have attached details of the terms and conditions of the policy. Valuations in excess of 300€ must be accredited by means of specific documentation pertaining to the animal, with the following considered valid to said effect: invoices, pedigree certificates and registration in the corresponding pedigree book. There is a 15-day elimination period for this cover, beginning on the inception date of the contract. If it is recommended owing to the irreversible physical deterioration of the animal, as the result of ageing or illness. In general an elimination period of 15 days is established for this cover. In the event of euthanasia as a result of ageing or illness, an elimination period of 4 months (beginning from the inception date of the policy) is established. Initial examinations, X-rays, analyses, electrocardiograms. Surgery or any other interventions, anaesthesia, surgical materials, medication for osteosynthesis, prosthetics and/or fibre-optic endoscopy that may be required. Post-operative care, treatment and time spent at clinics, where necessary. Internal injuries, breakage or trauma that impede the animal’s normal walking, running and/or jumping movement. Road-traffic accidents that occur while the animal is being transported in a motor vehicle. Falls resulting in internal injuries or trauma to the animal. Ingestion of foreign bodies, with a limit for this cover of one claim per period of insurance. Injuries or granulomas caused by the introduction of foreign bodies into the eyes, ears or skin. Any other bodily injury arising from a violent, sudden and external act that was not intended by the insured, including acts of vandalism. Any form of illness, including those transmitted via stings or bites from insects, mites, rodents or other mammals. Poisoning or intoxication, whether resulting from ingestion, inhalation, stings or bites. Injuries or illnesses caused by or arising from the age of the animal. Surgery of an aesthetic nature, such as operations performed on some breeds in order to shape their ears or tails and de-clawing. Death of the animal during surgery or as a result of same, if the surgery was performed for reasons not included under the accident cover. Any event arising from the practise of hunting. Slow or difficult deliveries or caesarean sections in female pedigree animals which generally require veterinary assistance when giving birth as a consequence of their anatomical characteristics, particularly brachycephalic breeds such as French and English Bulldogs and Boston Terriers. Expenses arising from the euthanasia and/or disposal of the remains of the insured animal. If the insured animal is recovered within 60 days of the date of the claim and if the indemnity has been paid out, theinsured may either regain possession of the animal and return the corresponding indemnity received, or, only when the insured has already acquired a new animal, retain the indemnity and surrender the animal to the sole ownership of the company. Likewise and up to the limit established as the sum insured for this cover, the policy shall also include the expenses arising from boarding the lost animal in the event that when it is found it cannot be returned to the insured immediately. Before travelling abroad: if a pet owner is thinking of travelling abroad, they can request specific information for the destination country in terms of the public health and administrative requirements for taking his/her pet there. Advice on administrative procedures: this service offers guidance on official procedures involving public authorities or private organisations that affect your pet. Any expenses that may arise from a particular course of action will be the responsibility of the animal’s owner. This cover is provided on the basis of the declarations made by the insurance policyholder in the insurance questionnaire/proposal form given to him/her by the insurer. This document includes the specific section “Declaration of the animal’s state of health”, which determines the valuation and acceptance of risk and the calculation of the corresponding premium. Surgery, anaesthesia and post-surgical veterinary care as a result of surgery. This item includes the necessary osteosynthesis materials and prostheses used. Hospitalisation of the animal at a veterinary clinic. Injectable treatment administered during the first clinical procedure following diagnosis of an illness. Medication used to ensure appropriate handling of the animal during the administration of veterinary treatment, including sedation or anaesthesia where this is a necessity. Injectable treatment required during surgery, including during post-surgical care, until the animal is discharged from the veterinary centre. Ectropion, entropion, eyelash disorders (distichiasis). Anatomical disorders associated with the structure of the nictating membrane/ third eyelid, such as protrusion, prolapsed glands or cartilage eversion. Elongated palate, with or without brachycephalic syndrome. Expenses arising from infectious diseases for which there is a vaccine, provided the corresponding immunisation schedule has not been followed. Any expenses arising from the infection (or suspected infection) of rabies. Expenses related to sterilisation or castration, unless this is deemed necessary to treat an illness suffered by the animal that is causing a serious deterioration to its physical condition. Any expenses arising from gestation, including diagnosis, monitoring and assistance during the birth, with the exception of expenses for assistance as a result of slow or difficult delivery or caesarean section. Abortion procedures and related consequences, along with expenses for artificial insemination. Slow or difficult delivery or caesarean section in female French or English Bulldogs or Boston Terriers. Surgery of an aesthetic nature or to correct defects. Oral cleaning and dental treatment of any kind, excepting those required as the result of an accident. Changes to the animal’s behaviour for any reason, e.g. aggressiveness. Any expenses concerning diet or dietary supplements, commercial feed or special diet feed prescribed by the veterinarian, along with all hygiene-related products such as shampoos, lotions and dental products. Expenses arising from known accidents, intoxication, poisoning, deformation, defects or illness of any kind (and the consequences of all the foregoing) that were contracted or evident and not declared by the insured before the initial inception date of the policy or during the stipulated elimination periods, the side effects arising from these, along with birth defects and congenital illnesses that were known and not declared when contracting the insurance. Healthcare treatment administered after the policy has been terminated, even if it is the result of illness that developed before the date of termination. Assistance received from a veterinarian who is not a member of the corresponding professional association. Expenses already covered by other insurance cover. In the sole event that the insurance policyholder and the insured are the same person, the following individuals shall also be considered as the insured, provided they are cohabiting with the aforementioned physical pet. His/her spouse or partner from a civil union. The children of both or either of the spouses or partners. Those individuals who are (or were at the time of the claim) the legal wards of both or either of the spouses or partners. The payment of judicial guarantees to ensure the civil outcome of the proceedings. The legal expenses, which shall be paid proportionally according to the difference between the indemnity that the insurer has to pay, in accordance with the terms of the policy, and the total sum that the insured is liable for as a result of the claim. Damage to individuals attending to the animal’s needs. Claims arising from the infraction of laws, regulations, ordinances and other legal provisions in force that apply to the possession of animals, particularly those relating to health and welfare issues. The payment of sanctions or fines, along with the consequences of their non- payment. Liability arising from infection or the transmission of diseases by the animals. Damage that is not caused by the insured animal. Psychological damage and any other form of damage other than that of a personal and material nature. Damage arising from the non-fulfilment of contractual obligations. The unlawful abduction of the insured animal. Indirect and/or consequential damage. This cover is limited to events which take place during the policy’s insurance period and for which claims are formally submitted during said period (or within one calendar year beginning on the date of termination or cancellation of the insurance). To this effect, the date of the claim will be taken as the date on which: The insurer or the insured receives the first formal notification of a third-party claim by a third party or the instigation of legal or administrative proceedings, or is presented with a formal request. Those produced when the claim is the result of wilful misconduct or gross fault on the part of the insurance policyholder, the insured, his/her relatives and/ or the persons with whom s/he lives or who are his/her dependants, including paid domestic staff and lodgers, when these individuals are considered perpetrators, accomplices or accessories. Indirect loss or damage of any kind caused as a result of a claim, unless they are expressly covered. Political or social acts or those occurring as a result of public disturbances, riots, strikes, internal disruption and sabotage, except for acts of vandalism. Civil or international war, whether officially declared or otherwise, public or military uprisings, insurrection, rebellion, revolution and war-related operations. Volcanic eruptions, hurricanes, heavy downpours, earthquakes, earth tremors, seaquakes, impact of the sea on coasts, floods, subsidence and any other meteorological or atmospheric phenomena. Events categorised by the public authorities as “national disasters or catastrophes”. Damage or loss of value caused directly by the mechanical, thermal and radioactive effects of nuclear reactions or transmutations, whatever the originating cause.